Take the challenge of this timeless word game! Draw family and friends together. When it comes to family fun, Scrabble is the classic word game. Take the challenge of making the best use of your 7 letter tiles for just the right combination of wordplay, competition, and enjoyment! 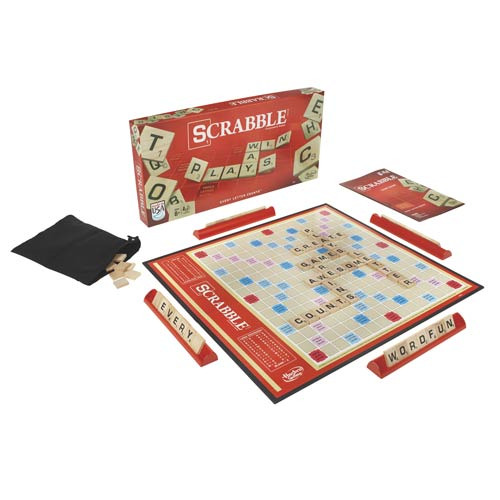 Scrabble draws family and friends together around the table with the joy of building interlocking words and the competition for racking up big scores. Connect the wooden letter tiles up, down, and across the board to create distinct crosswords in each contest. Whether you play traditional rules or those for shorter gameplay, there are new challenges and new excitement every time! For 2 to 4 players. Ages 8 and up. Package may vary.